Aloha! Welcome to magical, mystical, mythical Maui. My intimate, meticulously maintained one bedroom two bath condo is located on the 1st hole of the legendary Wailea Old Blue Golf Course. If you are searching for a first class yet budget friendly Wailea resort accommodation, you will find that and much more at Ekolu Village #903. Be captivated by the spectacular Pacific Ocean view the moment you open the front door. From the island of Kaho'olawe in the south, past Molokini to Lana'i and the Maui mountains in the west, look forward to awesomely dynamic sunrise to sunset tropical panoramas. EXCITING remodel! Recently, a five month top to bottom sensational renovation of the condo was completed. Walls, windows, floors, absolutely everything was replaced with the best of materials by the best of artisanal craftsmen. Throughout the condo, I upgraded to exotic African mahogany cabinetry, vibrant granite countertops, beautiful Italian porcelain flooring and top of the line large and small appliances. The kitchen is equipped with everything needed to fix 'onolicious' island style pupus to a sumptuous holiday feast. The bathrooms feature tumbled stone shower floors and plenty of space to tuck away personal items during your stay. The bedroom has a California King best quality mattress and a hotel style safe. With a keen awareness that to guests, function is as important as form, I believe we've achieved a perfect balance. The first post- remodel guests agreed. Immediately after their two week visit, they asked me if it was too early to reserve the condo for a month the next year! And they did! And they still reserve a month every year! Listen to what other Ekolu Village owners are saying about the renovation: 'A masterpiece', 'Stunning', 'Exquisite materials and impressive craftsmanship' and 'The new gold standard for Ekolu Village'. I just say Wailea Ekolu #903 is 'No ka oi', the best! Keywords: Magical ocean views, Totally luxurious condo with one bedroom, two full bathrooms, Remodeled using the best available "green" materials where ever possible. VIEW! VIEW! VIEW! The moment I walked into the condo the first time, I didn't leave until I bought it! Large decorator walk-in showers with premium fixtures. Spacious storage. Newly installed split-ductless A/C in living room and master bedroom. Luxurious bed and bath room linens. New large load LG washing machine. New large load LG dryer. Off road free and unassigned. New GE Profile side-by-side with ice maker and exterior ice and water access. Bosch smooth electric stove top. Beautiful fully functional kitchen with top notch appliances. Sony flat screen HD televisions. Apple TV box with free Netflix in living room. Tennis courts within walking distance in Wailea Resort. Premium golf courses throughout Wailea Resort. (2) There are two pools and the condo is half way between them. Both have bathrooms and changing areas. Beach Towels, Mats, Chairs, Umbrella and Cooler provided. Difficult to depart from our home away from home situated in the quiet Ekolu complex, handy to shopping, restaurants beaches etc. The condo has been professionally updated and decorated and commands a great view of the water (including breaching and blowing humpbacks during their yearly migration). A very special piece of paradise!! This is a really beautiful Condo and Beth was so wonderful to deal with. She was easy to contact when we had a few issues with arrival and stayed in touch until the issues were resolved. The condo is updated, clean and fresh. We had everything we needed for our stay. I loved this place and would totally stay here again. There is some construction going on in this area so I am not sure how it will effect the view from the condos on this side. Hopefully there won't be much of an impact because the view of the golf course with the ocean beyond made for glorious sunset photos. Thank you so much for such a positive review. Guests like you have made it a joy to share my condo for almost 17 years. Thank you for mentioning the construction occurring to the right across and below the golf course. I had the same concern and met with the Wailea Community Association management to investigate while at the condo in late November and early December. I was assured that IF any residences were built there they would have stringent height restrictions. I emphasize IF because those structures are considered undesirable due to complete lack of ocean or other tropical views and are situated on a busy thoroughfare. Again, mahalo nui loa for your comments and I will look forward to hearing from you again. This was our homebase for our week on Maui. The view is better than the picture. The location in Wailea is ideal. The unit itself was clean and well appointed. We had a great stay. Would recommend it. If the other reviews didn't convince you... maybe this one will. 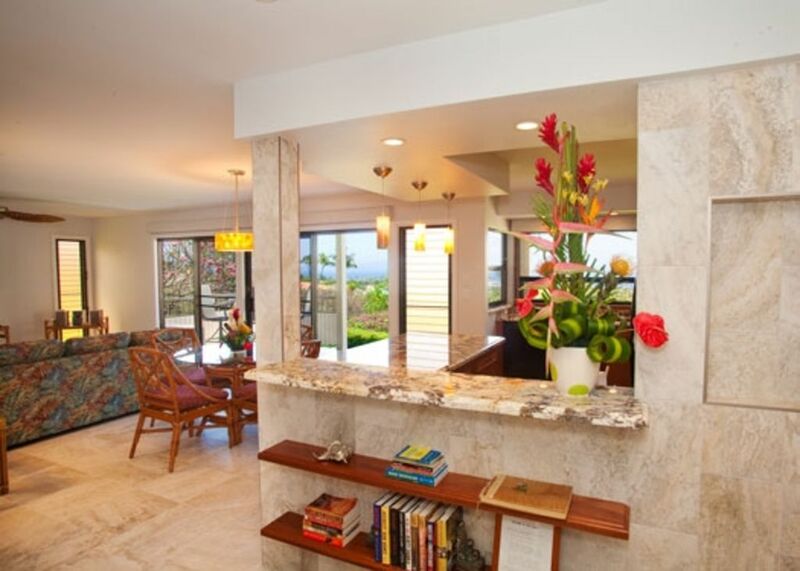 THIS is the answer to your Maui condo hunt!! We stayed for 10 days and loved everything about this place. The location is amazing if you love long beach walks. The view is incredible - pictures don't do it justice. The unit itself is super convenient being on ground level, super open concept and very spacious. The kitchen is amazingly stocked, with literally everything you need. Super comfy bed, nice sheets and ultra quiet A/C makes for wonderful sleep. The owner was extremely friendly and quick to help with anything we needed! Highly recommend! Great decor, clean, as good or better than the VRBO pictures. We stayed for 2 weeks and could have easily stayed for 2 more. The grounds were very well cared for. We are very happy that we chose Beth’s condo. Beth you have a wonderful Hawaiian home. Bob, I can't thank you enough for your review. Given that there were a couple of issues which needed to be addressed during your stay, I truly appreciated your patience with having me attend to them. Of course, I would love to have you, your family and friends return to my condo whenever your plans include Maui. To secure a reservation, the equivalent of 2 nights rent plus a $300.00 refundable security deposit is required at booking. Remaining rental fees are due 60 days prior to arrival. My tax Hawaii tax ID is W00414504-01 Squeaky Clean, LLC, provides cleaning and handy man services for my condo. Karl Stolmeier is the owner. PLEASE CONTACT ME FIRST SHOULD YOU NEED HIS SERVICES.